Bill Clinton: I Hope Democrats Back Tax Deal : It's All Politics Clinton said the tax cut compromise was the best bipartisan deal Obama could get. He said its passage was critically important to keep the economy from sliding back into recession. 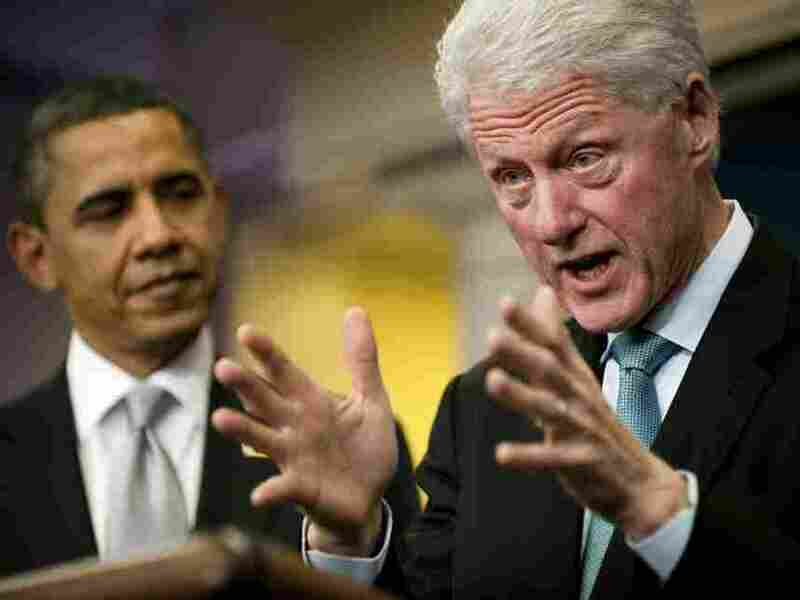 After meeting with President Obama at the White House, former President Clinton appeared before the cameras to encourage rebellious congressional Democrats to accept the Obama-GOP tax-cut compromise. Obama and Clinton entered the briefing room together. Obama spoke first, reprising arguments he made in recent days on behalf of the compromise. Then Obama stepped aside and Clinton stood at the podium with the White House logo behind him, giving probably more than a few observers a sense of deja vu even though the former president was thinner and obviously older than his 1990s version. He spoke for half an hour. The agreement taken as a whole is, I believe, the best bipartisan agreement we can reach to help the largest number of Americans and to maximize the chances that the economic recovery will accelerate and create more jobs and to minimize the chances that it will slip back. It's happened in other financial collapses -- like that's what Japan faced -- and something that we have to avoid in America. The meeting between the 44th president and the 42nd one intrigued White House watchers who thought Clinton, the Comeback Kid who won re-election in 1996 after Democrats lost control of Congress in 1994, could be a model for Obama. Clinton's political success back then has often been credited to a tactic called "triangulation" in which political consultants decided to position him above the partisan fray of warring Republicans and Democrats. Clinton was asked about triangulation at Friday's briefing but sidestepped the question. "I'm out of politics now," he said.